On Saturday, 30 January, the amazing involvement of Mr Phil O’Donovan in the liturgical life of the SMA Wilton parish was recognized during the 10am Mass. 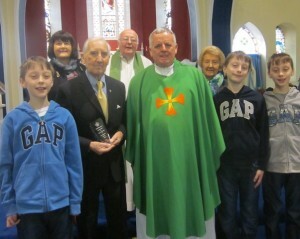 Fr Michael O’Leary SMA, PP, was the Principal celebrant assisted by several other SMA priests. 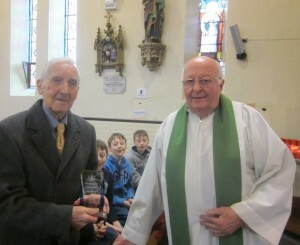 After the Gospel, Fr Tom Harlow spoke of Phil’s work in the parish and community and made a presentation to him on behalf of the Parish Assembly and parishioners. The following is an edited version of Fr Tom’s words. “Today we honour and give thanks to God for the gift of musicianship given to Phil O’Donovan. His skilful organ playing did not come from any formal training but is a God-given gift. He has been so generous with it to the benefit of both our St Joseph’s SMA parish here in Wilton and the Parish of the Way of the Cross in his native Togher. 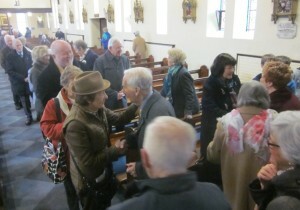 For 60 years Phil added to the quality of our liturgical celebrations here in Wilton until forced to step down due to the difficulty of climbing to the Organ gallery. Our early morning Mass and the 10am Saturday Mass was always enhanced by Phil’s music and singing. His playing was always from the heart. Phil has a lifelong involvement in church and community. For this he justly received the Bene Merenti Medal and many other awards. 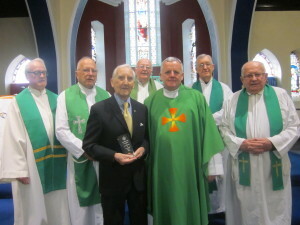 The presence of Fathers John O’Keeffe, Con Murphy, Tom Kearney, Tom Harlow is a sign of how much the SMA appreciate your friendship and involvement with the Society. Phil, thank you for the music and we wish you continued good health and joy.